Simon & Schuster Books for Young Readers, 2016. 48 p.
A young boy named William finds that overnight the tree outside his orphanage was transformed to look like an owl. Each night a different tree is turned into an animal topiary. 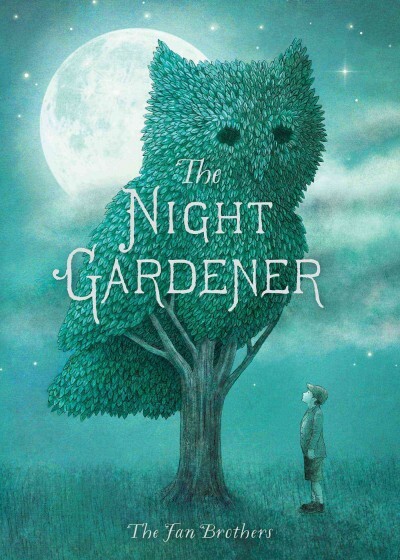 With each new masterpiece by the mysterious night gardener, the trees and the people change on Grimloch Lane—especially William. This is a brilliant book. The subtle changes in the town and color palate come gradually at first…until by the end of the book readers will see how different the end feels from the beginning. This is a story of hope and wonder in small actions. William and his wonder mirror the wonder of the whole town along with the young readers who will enjoy this book. And that is what I like the most. Here is William, a young boy who lives at an orphanage. His excitement at the beginning of the book consists of drawing in the dirt with a stick. By the end of the book William has been taught new artistic skills that help the whole town enjoy life a little more. This book goes beyond telling the world that wonder happens and magic is real. It shows readers how they can be a part of the magic and can help others discover wonder. This book is one to read and re-read. And then to read once more.